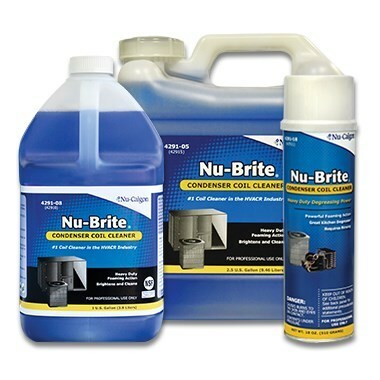 Nu-Brite® is a non-acid, alkaline-based product for cleaning and brightening air cooled condensers. It is formulated with the best available foaming detergents and chelants to quickly penetrate and dissolve greasy dirt and grime and foam it right out of the coil. The safer alternative to acids. For cleaning and brightening air cooled condensers and other finned heating and cooling coils located outside. It is an alkaline based cleaner that does all that an acid will do without the danger of an acid. Nu-Brite®'s state-of-the-art surfactants and cleaners instantly penetrate and lift layers of oily grime and corrosive deposits from the coil. Its foaming action pushes this loosened debris out of hard-to-reach areas restoring equipment to peak efficiency. It is not recommended for indoor use.